Maybe you made the spontaneous decision to host a dinner party and you’re now racing against the clock, or maybe a friend called at the last minute to let you know that they’ll be bringing a +3. The point is, you never know when you might need to rally your forces and add a salad onto the menu. It’s more than likely that you have all the essential ingredients for a simple vinaigrette hanging out in the cupboard or inside the refrigerator door, and it’s handy to have at least one killer go-to recipe that you can whip up at the drop of a hat. Read on to learn up on all of the basic principles, ratios and techniques you need to know in order to build your perfect recipe. We’ve done the research and testing so that you’ll have the best-dressed salad on the block! The Oil: Good ol’ olive oil is usually your best bet. You can play around with others, but you should generally stick with a neutral oil. The acid, the component that packs the big punch, requires a little bit more thought. The Acid(s): Normally vinegars, fresh-squeezed citrus juices or a combination of the two, your selection will impact the flavor profile of the dressing. White wine or champagne vinegar yield relatively lighter, milder vinaigrettes than balsamic, while apple cider vinegar is commonly used for a fruitier taste. There is also rice vinegar, which is often used in Asian-inspired recipes. Citrus juices are usually used in unison with vinegar, enhancing its flavor rather than replacing it altogether. Because of their high acidity, lemon, lime and orange are the most commonly used. All three add tartness, while orange juice adds sweetness as well. While there are many simple recipes that work off of the two above components alone, an often-used third item is a binder, such as mustard or honey. The Binder(s): The term “binder” helps to illustrate that these ingredients are used not only for their taste, but also because they facilitate emulsification of oil and acid by (you guessed it) binding them together more stably. 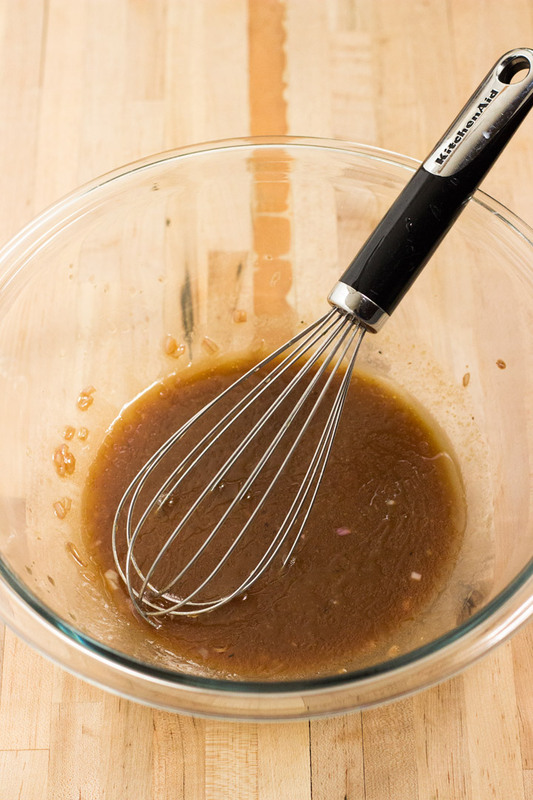 Without a binder, even a perfectly emulsified dressing will separate fairly quickly and require additional whisking before serving. Bold mustards like dijon or whole-grain are good to use for the best flavor, and then sweet binders like honey or maple syrup counterbalance tartness and acidity. Flavorings: Oh, it doesn’t have to stop there. Additional flavors can be as simple as a little salt and pepper, but other potential flavorings include: minced garlic, onions or ginger; fresh herbs and dried spices. All of these make for a more complex dressing. Emulsification: The idea is to combine your ingredients in the right proportions and to thoroughly blend the oil’s fat molecules into the watery vinegar, with or without help from a binder. This process is known as emulsification, and marks the point where your ingredients officially become a salad dressing! 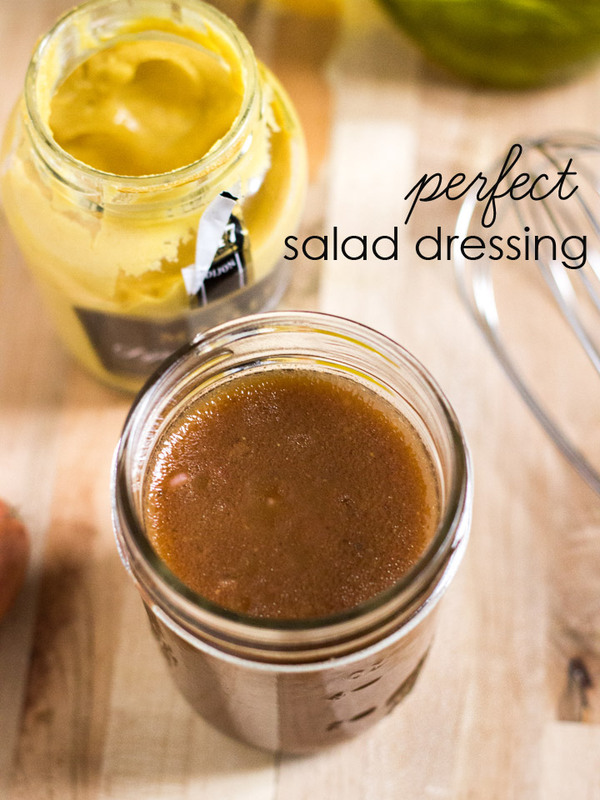 The secret to any tasty dressing lies in its proportions. The most important ratio applies to the first two components, and it is 1:3, one part acid to three parts oil. This is a classic rule and a good place to start, but is by no means set in stone. If you find that you like a little more acidity (if you want your dressing to stand out more), try bringing that ratio closer to 1:2 by adding more vinegar, lemon juice etc. 1. 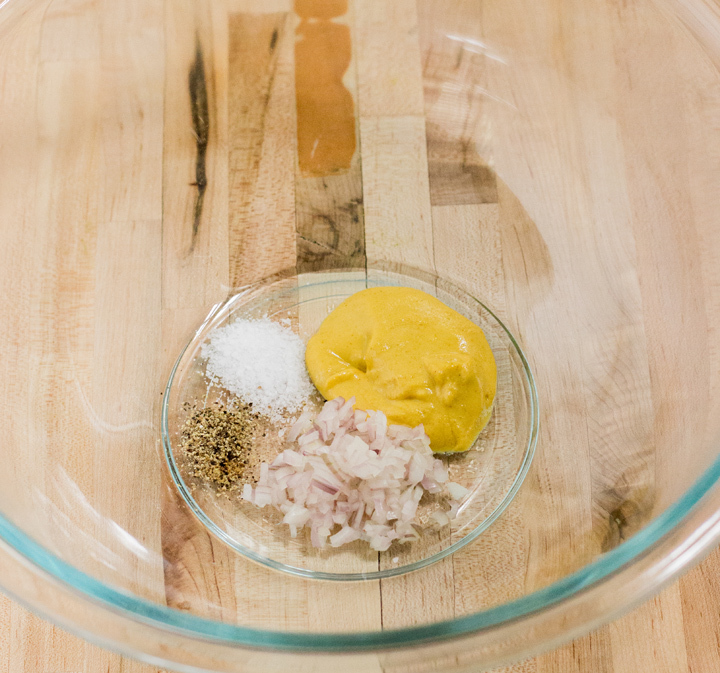 Gather your mustard, lemon juice, shallots, salt, and pepper in a bowl. Glass or stainless steel works – basically everything besides aluminum. Acids will react with aluminum and produce an unwanted metallic taste. 2. Add the vinegar and whisk to combine. 3. Slowly stream in the oil and beat vigorously with the other ingredients until they have emulsified. There is no such thing as pouring too slowly or whisking too quickly. 4. When properly emulsified, ingredients are suspended throughout the mix, and it should look homogenous. If ingredients are separating out at all, then you will need to whisk more. Transfer to a jar and store in the fridge for up to a week. 5. When it comes time, to properly dress your salad, drizzle a few spoonfuls of vinaigrette around the edge of the bowl with the dry ingredients. Using tongs (or your hands! ), lightly toss the salad to distribute the dressing. 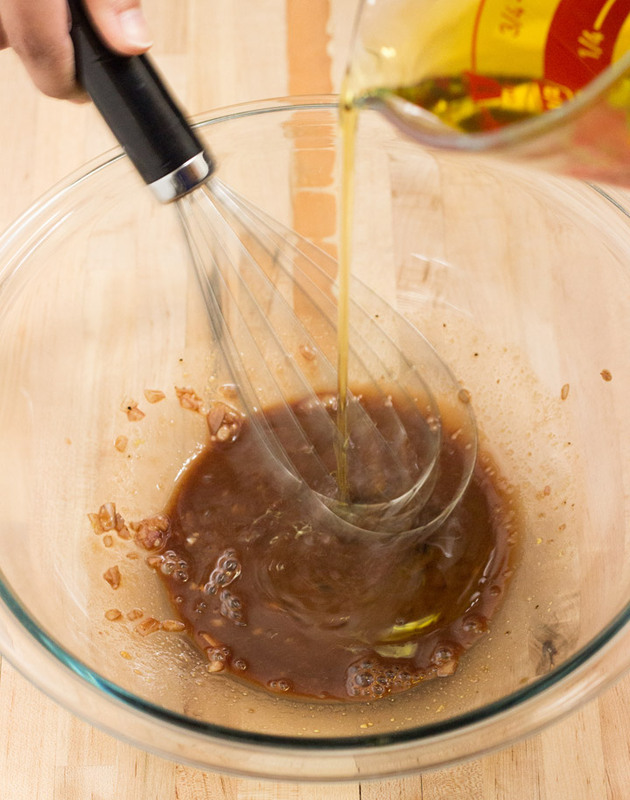 For a lighter, milder vinaigrette, change from balsamic to champagne vinegar. For added texture and a slightly different taste, use whole grain mustard instead of dijon. Introduce a sweet binder – either honey or maple syrup. Match with the amount of mustard you use (starting with 1 tsp). Honey and dijon are a classic matchup; maple syrup actually pairs well with spicy brown. 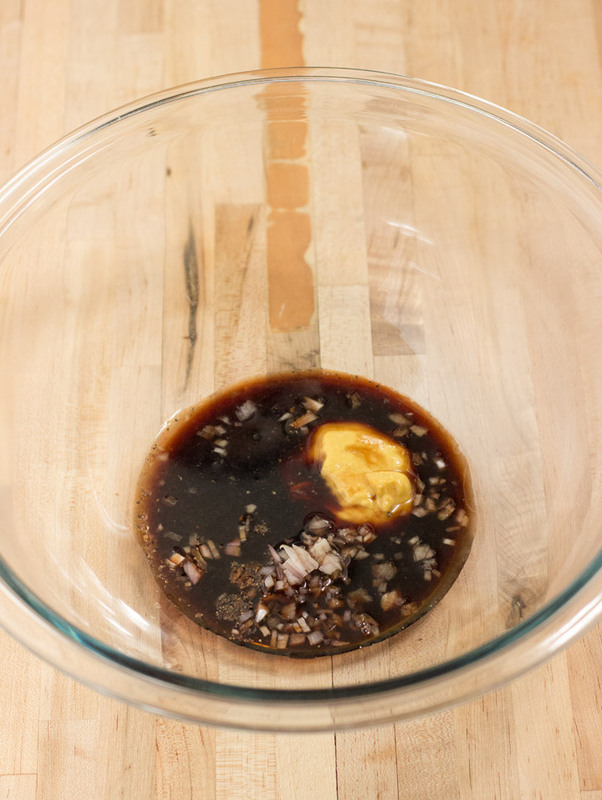 For a more complex balsamic vinaigrette, add in about two cloves of minced garlic (this will equal 1 tsp). Try adding shallots as well; mince ½ a shallot and cut the garlic down to one clove. For an orange vinaigrette, swap out lemon juice for orange. Since orange is not as acidic, you can use more (2 tsp instead of 1 tsp) and still achieve a balanced dressing. Orange juice will go well with either balsamic or white wine vinegar. If you know you like more acidity/ want your dressing to stand out more, try altering the ratio from 1:3 closer to 1:2. There are some alternative mixing methods to using a whisk. A blender works really well and you can also shake it up in a sealed glass jar – mason jar, anyone? If you are using garlic (or shallots, ginger, etc. ), be sure to mince very finely, not only to ensure that pieces will be incorporated evenly throughout the dressing, but also because nobody wants to bite into a big honkin’ piece of garlic. If you are using additional ingredients , then it’s a good idea to let the flavors meld for a while. 1–3 hours outside of the refrigerator will do the trick! If you aren’t using a binder, simply whisk again before serving.